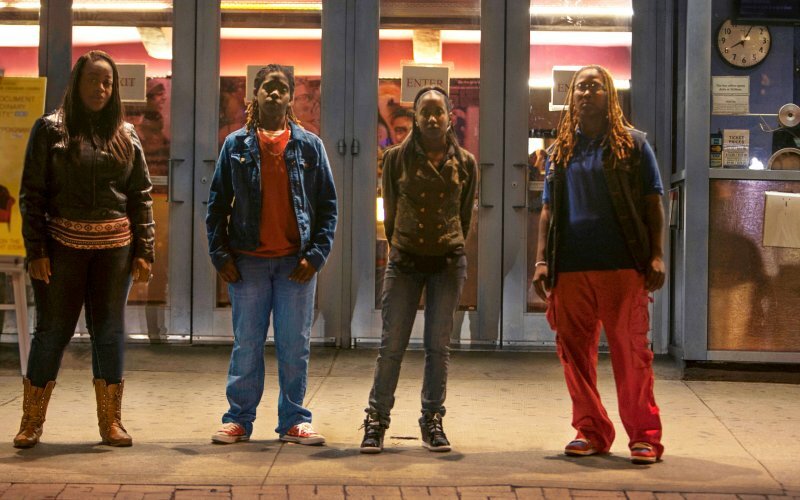 Out in the Night is Director Blair Dorosh-Walther’s first feature documentary (74 min), which reveals the story of “The New Jersey Four”—Venice Brown, Terrain Dandridge, Renata Hill and Patreese Johnson—from their perspective. Click here to watch the trailer. As the documentary shows through security camera footage, the group was harassed on the street by 28-year-old Duane Buckle. He later claimed that he merely said “Hi” to one of the women, but they claim he said “I want some of that,” motioning to one woman’s crotch. She informed him that she was a lesbian, and he began shouting threatening and homophobic remarks, saying, “I’ll f*** you straight.” Duane proceeded to rip the hair of one woman and choke another. The women tried to defend themselves, and two male strangers temporarily joined the fight to help them. At one point Duane reached for his messenger bag, and the women feared he was getting a gun. Patreese Johnson took out a pen knife and slashed at Duane, slicing his bag and also stabbing him in the stomach. The inflicted wound was so small that Duane later claimed that he did not realize he had been hurt. Neither did the women, though Duane later began bleeding. Police were called to the scene and all seven women (who had no criminal records) were arrested, charged with assault and attempted murder, and were constantly referred to as a “gang” by the courts and, especially, the media. Three of the women took plea bargains, pleading guilty to a violent felony, and served 6 months each in prison. Brown, Dandridge, Hill, and Johnson pleaded not guilty, were all convicted, and each sentenced to between 3 and 11 years in prison. Dorosh-Walther follows each woman for years during and after incarceration, interviews them and their families, their attorneys, members of the media, and others. The documentary explores the case and all its complexities, including underlying issues relating to homophobia, racism, gender inequality, economic disparities, the power of media in crime investigations and perhaps most significantly, how the consequences of these varying issues impacted the women involved. The film invites the audience to consider difficult questions, like who is able to claim self-defense? How should we factor in post-traumatic stress disorder when considering how victims of sexual violence react to new threats of similar violence? Why did the media paint the women as “killer lesbians” out looking for a fight, rather than victims acting in self-defense? Does the current narrow focus on marriage equality obstruct a larger conversation of basic rights for gender non-conforming individuals—including the right to safety on public streets, a just law enforcement system, and trustworthy law enforcement agents? Out in the Night’s world premier took place on June 15, 2014 in Los Angeles, and marked the launch of the Film Independent and the United Nations joint project: the Free & Equal Global Film Series, which features a collection of curated films that explore LGBT and intersex people around the world, in attempts to educate against homophobia and transphobia. Dorosh-Walther was recognized by Sundance Film Festival and Film Independent, and she was also awarded the Joyce Warshow Fund from Astrea Lesbian Foundation for Justice. Check the film screening schedule for times and locations. I am glad to have found this post because I had never heard about this incident. I find it very disturbing that even in New York City in the West Village, which is considered to be a very progressive, tolerant neighborhood, an incident like this could happen. I remember about a year or two ago there was a string of attacks targeting the gay community outside of many bars and clubs in New York City, and I was surprised to hear that this is still happening in New York City. The fact that incidents like this are still occurring in a very tolerant, open-minded city like New York makes you realize the challenges that the LQBTQ community still faces. If incidents like this are still happening in NYC, it’s scary to imagine what is happening in other parts of the world and country. One of the most disappointing aspects of this incident was not only the attack, but that the police and criminal justice system failed to defend the victims.